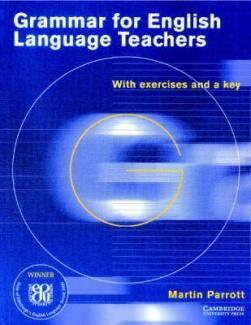 Grammar for English Language Teachers by Martin Parrott won the prestigious English Speaking Union‏‎ Duke of Edinburgh’s English Language Award in 2000. This comprehensive and practical guide is a refreshingly new type of grammar reference book and an invaluable bank of ideas, tasks and inspiration for developing language awareness of your students and your own. Each grammar point is explained in detail; each area of grammar is dealt with expansively and broken down in its components, which further outline specific teaching points such as construction and use. The grammar explanations are very accurate yet easy to follow. The author offers them from the perspective of a real classroom environment. The layout is also good and easy on the reader with large sections of text broken up with tables and bullet pointed lists and examples. Chapters are put in logical order and paragraphs are well spaced. Clear sub-headings include Key Considerations, What Is…, Consolidation Exercises, and Difficulties For Learners sections. With its focus on classroom instructions, this quality grammar reference book is a useful reference guide for prospective and practicing teachers and teacher trainers alike. The prestigious English Speaking Union Duke of Edinburgh’s English Language Award is made annually for the best and most innovative work in the field of teaching or learning the English language. In 2000 the award went to Martin Parrott and his grammar book for teachers which was chosen from over 30 entries by a panel chaired by Lord Randolph Quirk. The prize was presented by HRH the Duke of Edinburgh at a special ceremony held in Buckingham Palace, and attended by author, Martin Parrott and the Senior Commissioning Editor, Alison Sharpe.